This title is directed primarily towards health care professionals outside of the United States. 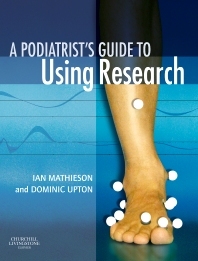 This title gives practical and jargon-free guidance for practitioners looking to understand, critique and use research to underpin their clinical decision-making. The authors explore the principles and methods used by the active researcher to help consumers of research develop the skills they need to approach and constructively use the extensive data available to consolidate and develop their own practice. With a demystifying and down-to-earth approach throughout, this book examines the mechanics and principles of literature searches and how to formulate appropriate questions to guide searching and extract relevant information; looks at systems of critical appraisal; discusses research methods in a focussed discussion that uses case studies as examples; explores how the resulting enhanced appraisal and understanding can inform changes in practice; and considers the rationale for change and how informed and reasoned change in practice can be measured to monitor outcomes. Chapter 2 What it is all about? Chapter 7 Don’t lose it, use it! Chapter 8 What difference does it make?